Good 4 Kidz in Petersburg, Virginia, was faced with a challenge many child care and early education centers in cities are faced with—no outdoor play space. Toddler teacher, Sharyn Hall, had the idea of using part of the parking area as outdoor space for physical activity. “As a participant in the National Early Care and Education Learning Collaborative Project (ECELC), I learned the many benefits of physical activity. This increased my desire to provide more opportunities to engage the children in outdoor activities,” stated Hall. After receiving permission from Program Director Sheila Henderson, Hall met with the business owner next door with whom they shared the parking area. They discussed the program’s desire to have an outdoor play area and potential options. After the discussion, both parties came to an agreement: Between 10–11 a.m. the parking lot would be closed to the public and used as an outdoor play area for the children. 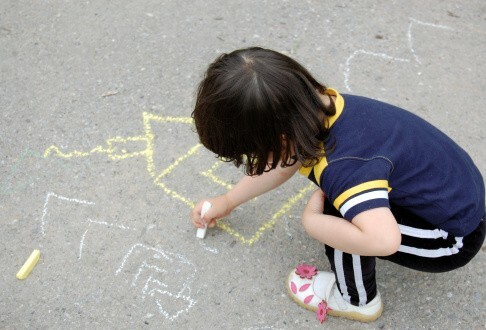 With a designated outdoor play space available, children began to engage in activities using riding toys, sidewalk chalk and other structured and unstructured outdoor play. “Once we started taking the children outdoors regularly I noticed behavioral changes and the children began to sleep better at naptime,” said Hall. The center has also noticed a change among parents. With the parking lot closed for an hour, parents began to bring their children in earlier to allow them the opportunity to play outside. Parents remarked that their children have been requesting “outdoor time” at home as well. The center continued their quest for increasing physical activity throughout their center by cutting down the amount of screen time offered. Teachers began using movement CDs with their lessons and other activities to get children moving indoors as well. “I’m very proud of the efforts my staff is showing in keeping children healthy and active. We are discovering creative ways to include more active and outdoor play,” exclaims Henderson. Tender Times Child Care owner Teresa Storm had limited program resources. She got kids moving by applying for funds and researching creative, low-cost ways to stay active. On the days that going outside isn’t possible, there are still plenty of ways to keep kids active. With a little creativity, child care providers can come up with high-energy indoor activities.